LEGO has released the details and images for the Big Ben (10253), available to buy from 1 July 2016, with early access for VIPs from 15 June 2016. With more than 4,100 pieces and over 60cm tall, this set is massive! See the photos here in their high resolution glory! Big Ben features a detailed section of the Westminster Palace and the adjoining Elizabeth Tower, 4 detailed clock dials with movable hour and minutes hands, and a sidewalk, tree and grass area depicting the building’s location. Remove the top of the tower to access the Big Ben bell. Put your LEGO® building skills to the test! Special elements include 4 printed clock faces. Rare elements include ski poles, flowers and corner plates in molded gold color, and tinted-translucent elements. Big Ben measures over 23” (60cm) high, 17” (44cm) wide and 7” (20cm) deep. LEGO has published high resolution images of the Ferris Wheel (10247), which is due for release in June this year. LEGO describe this model as wonderful, iconic, majestic, delightful and magical. I largely agree, although I think that “iconic” should be reserved for RedCoKid’s Ferris Wheel! I love the colour scheme of the Ferris Wheel and also that it can be motorised, but the bit that actually caught my eye were the topiary trees. I presume these use the new stem pieces with the extra (uhm …) stem bits for holding more flowers. 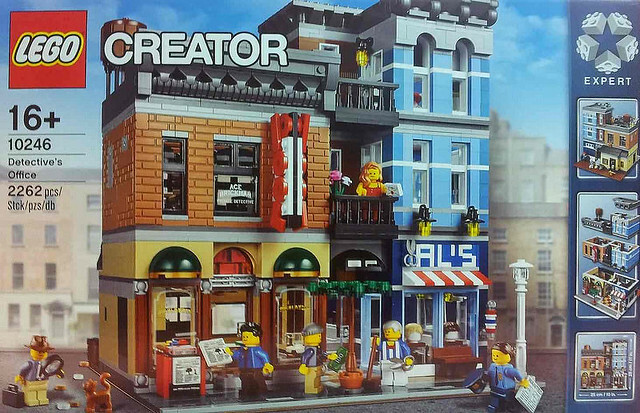 The first image of the Detective’s Office (10246), TLG’s modular building for 2015, has been revealed by stuifzand on lowLUG. My favourite parts of this building is shopfront on the left building, especially the columns and the printed(?) windows. Overall, though, I think I am going to need a little bit of time for this one to grow on me. Either way, it looks like it is going to be a great parts pack! 22/11 Update: Just had a look at the high resolution images now available on Eurobricks, and it’s awesome. Love it! !